"Knit and Crochet Today" is a Public Broadcast (PBS) television show about knitting and crocheting. The host of the show is Kassie DePaiva, star of the daytime soap opera "One Life to Live." "Knit and Crochet Today" is a 30-minute "celebration of all that's fabulous about crochet and knitting, a place to learn new techniques, see cutting-edge crocheters and knitters demonstrate their fabulous designs, and get loads of inspiration", according to the Coats and Clark website about the show. The show is hosted by Kassie DePaiva an actress on the daytime drama "One Life to Live," a talented crochet designer, and creator of "Happy Hats," a line of crocheted beanies to support charity. Knit and Crochet Today is in its third season of broadcasting. On the "Knit and Crochet Today" website, you can watch past episodes, buy DVDs of the show, get free patterns, read the blogs, sign up for newsletters, and support the show. If you want to catch the show weekly on television, go to PBS for a schedule of when the show is on in your area. Each episode is shown approximately three times a week on PBS. Coats and Clark, a needlecraft company established nearly 200 years ago, is the sponsor of "Knit and Crochet Today." Their sewing and needlecraft products are sold in over 150 countries. Coats and Clark publish the bi-monthly magazine called Crochet Today that has been popular for many years. Knit and Crochet Today has six experts that regularly co-host the show with Kassie DePaiva. Brett Bara is editor-in-chief of Crochet Today magazine, previous craft editor for Woman's Day magazine, and contributor for several other major magazines. She has over 20 years of crafting experience. Kristin Nicholas learned to knit when she was only nine years old. She has a bachelor's degree in textiles and clothing and worked for 25 years in the needlework industry. She has authored eight books about knitting and needlework. Robyn Chachula was an engineer by day and avid crocheter by night. She began engineering and creating crochet patterns and started her own crochet design company. Maggie Pace comes from a family who traditionally started and owned crafting companies. Maggie began a felted knit design company called Pick Up Stix in 2003. Drew Emborsky is the only male expert on the Knit and Crochet Today show. He is famously known as "The Crochet Dude," creating quirky designs for both kitting and crocheting. Being one of the few male knitters and crocheters has propelled him to the cutting edge of fiber design. Myra Wood, an avid crocheter and crafter, is internationally known for her fiber and bead work. Kassie DePaiva is one of the most popular daytime stars of "One Life To Live" as well as hosting the "Knit and Crochet Today" show. She has always been an avid crocheter and actress but has recently gotten in to the music industry with her new album "I Want to Love You." Kassie wanted to do something meaningful and creative and came up with her Happy Hats idea. 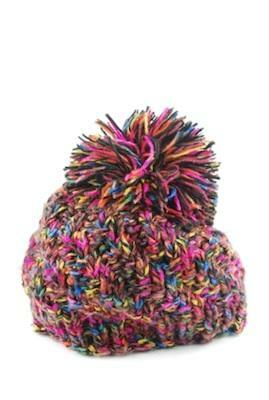 Happy Hats are fashionable beanies designed and handmade by Kassie DePaiva. Kassie's designs are cute and whimsical. All her hats are one-of-a-kind, handmade, and shipped by Kassie herself. Each hat comes with a complimentary copy of her latest music CD, "I Want to Love You" All proceeds go to the charity The League of Hard of Hearing, also known as The Center for Hearing and Communication. Kassie has a son who was born with profound hearing loss, and the League of Hard of Hearing was an amazing resource and support group for her and her son. "Knit and Crochet Today" is entertaining to watch and inspiring for your crafting endeavors.